Barton’s Kianna Wynn muscles her way between Southern Wesleyan’s Iva Krstevska (10) and Lisana Burnett (3) for a shot during Saturday’s game at Wilson Gym. Wynn came two points from a career high with 36 points as she and senior teammates Dinah Neal and Carmen Richardson celebrated their Senior Day with a 103-74 victory, tying the Lady Bulldogs with Belmont Abbey for first place in Conference Carolinas. Barton senior Carmen Richardson (32) puts up a shot over Southern Wesleyan’s Iva Krstevska during Saturday’s game at Wilson Gym. Barton’s Dinah Neal drives to the basket late during the third quarter of Saturday’s game against Southern Wesleyan at Wilson Gym. Neal, one of three Lady Bulldogs honored on Senior Day, had 12 points in their 103-74 win. 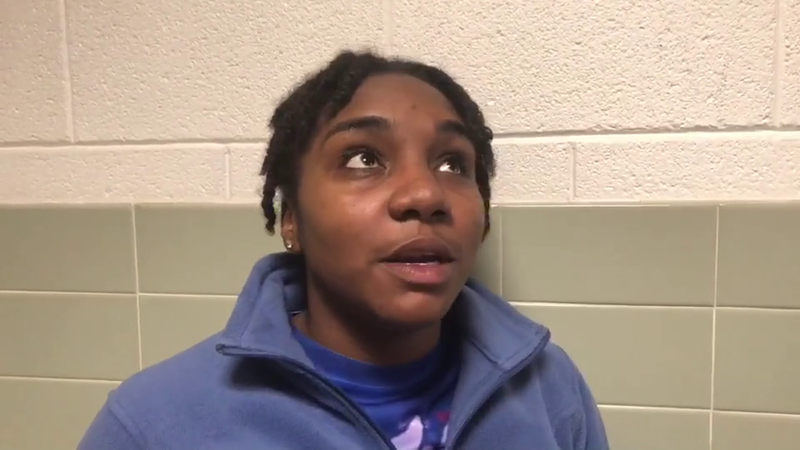 Playing in front of a Senior Day crowd that included members of her family wearing T-shirts with her face adorned on them, Barton College senior Kianna Wynn had a game she won’t soon forget in the Lady Bulldogs’ 103-74 win Saturday against Southern Wesleyan University at Wilson Gym. Wynn, third all-time in school scoring history, was two points away from her career-high with 36 to go with 11 rebounds. Wynn said she was nervous the night before. The win was also big for the Lady Bulldogs, now 19-4 overall after their fifth straight win, who moved into a tie atop the NCAA Division II Conference Carolinas with Belmont Abbey, which was upset at Erskine on Saturday. Barton and Abbey are both 12-4 in league play. The reigning champion Lady Bulldogs said they will bring the title home again this season. 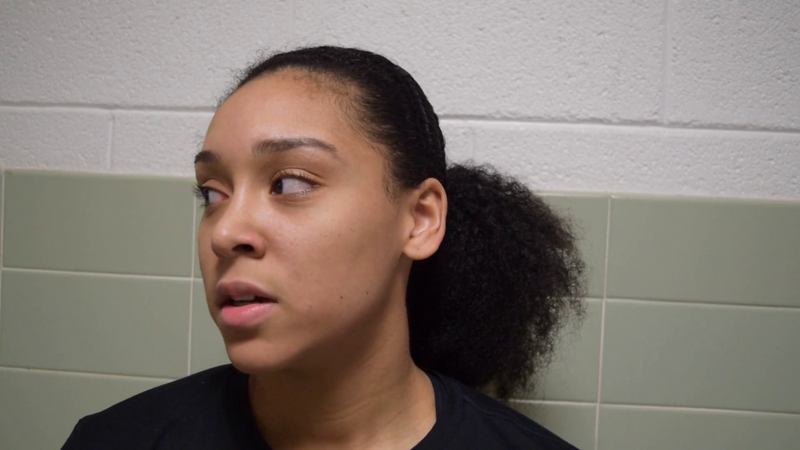 “We’re all going to get a ring this year so it’s positive energy all around,” said senior Dinah Neal, who supported Wynn’s effort with 12 points, four assists and two steals. The two have played together for the last four years and Neal said Wynn has been a part of her growth. “We had to come together and get this win and celebrate our four years together,” Neal said. The third Barton senior, Carmen Richardson, is playing her first year in Wilson after transferring from North Carolina Wesleyan College. 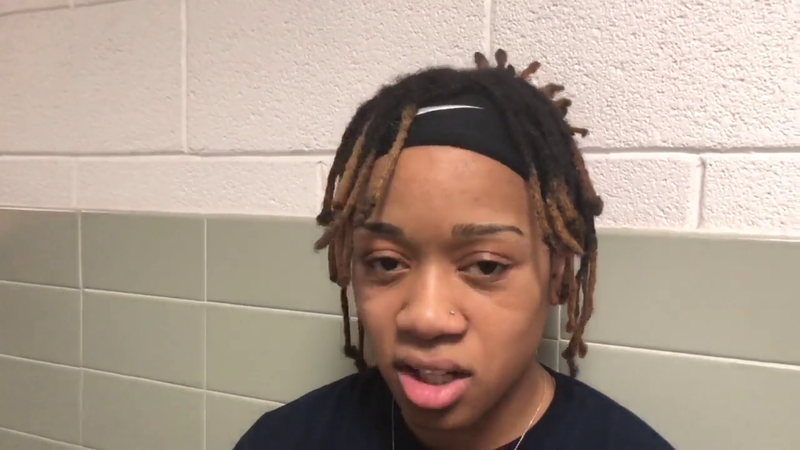 Richardson, a Rocky Mount native, scored five points and after the game reflected on the perseverance it has taken her to get to Barton. The Lady Bulldogs also got a big performance from sophomore Shanika Peterkin, who had 16 points and 11 rebounds. Barton, which never trailed, used a 6-0 spurt fueled by Wynn and freshman Akira Wiggins at the end of the first half to post its biggest lead at the time, 58-44, at halftime. Wynn and Peterkin combined for six straight points to start the second half and increase Barton’s lead to 20. Jessica Sparks had 22 points to lead the Warriors (8-16, 3-13 CC). Barton will play its final regular-season home game Tuesday against archrival University of Mount Olive.